Preheat oven to 160 deg (fan forced). Add saffron powder, egg and vanilla and beat well. Sift the flour and baking powder together and stir into the mixture until well combined. Roll teaspoons of mixture into the a ball and place on a greased baking tray, leaving room to spread. Flatten with your fingers. 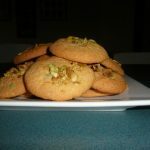 Sprinkle each biscuit with chopped pistachio nuts. Bake for about 12 – 15 minutes in a moderate oven. leave to cook on the trays for about 5 minutes then carefully lift onto wire colling racks to cool.